Innovative laser processes are revolutionizing industrial manufacturing worldwide. They are characterized by extraordinary reliability and productivity, fine precision, and flexibility. It is only because of our laser processes that efficient series production of new and innovative components and products are made possible. Our technologies and systems are successfully utilized in high-tech industries and by innovators like the photovoltaic and semiconductor industries, micro diagnostics and failure analysis, display-and-smart glass-production, electronics manufacturing, medical technology, and ophthalmic optics. Cost, quality and throughput are major factors in achieving successful manufacturing in the semiconductor industry. With the growing adoption of new types of wafer substrates, thinner wafers and scaling to smaller dimensions and larger-size substrates, wafer dicing is evolving as a critical value-add process step that not only ensures, but also further enhances, semiconductor device yields. At the same time, traditional scaling of feature sizes in microelectronics is becoming increasingly cost prohibitive in order to add more functionality on devices within a smaller footprint. As a result, chip manufacturers are turning toward vertical stacking of devices and heterogenous integration schemes to enable smaller, higher-performance devices. This has created a greater need for methods of processing surface layers of the device without affecting buried structures, as well as selective exposure of functional areas on the device. 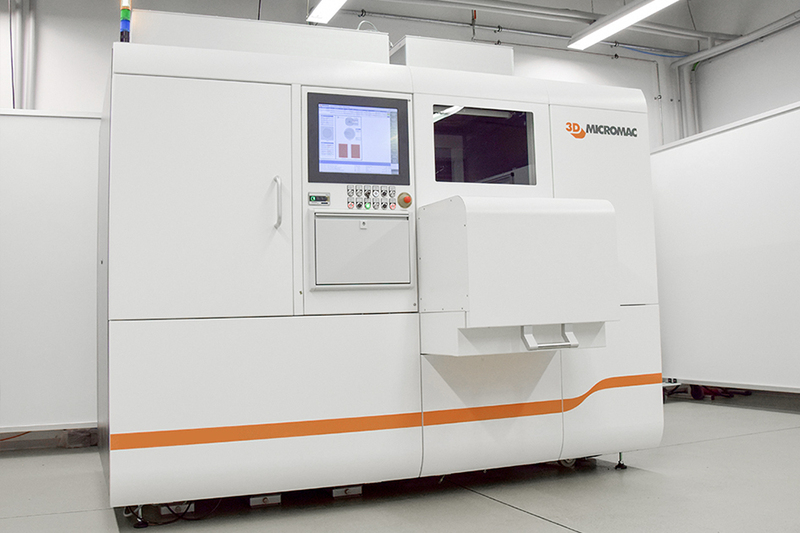 3D-Micromac addresses these critical needs with its microDICE™ laser micromachining system leveraging TLS-Dicing™ (thermal laser separation) for wafer dicing, and its microPRO™ RTP selective laser annealing system. The microDICE™ laser micromachining system leverages TLS-Dicing™ – a unique technology that uses thermally induced mechanical forces to separate brittle semiconductor materials, such as silicon (Si), silicon carbide (SiC), germanium (Ge) and gallium arsenide (GaAs), into dies with outstanding edge quality while increasing manufacturing yield and throughput. Compared to traditional separation technologies, such as saw dicing and laser ablation, TLS-Dicing™ enables a clean process, micro-crack-free edges, and higher resulting bending strength. 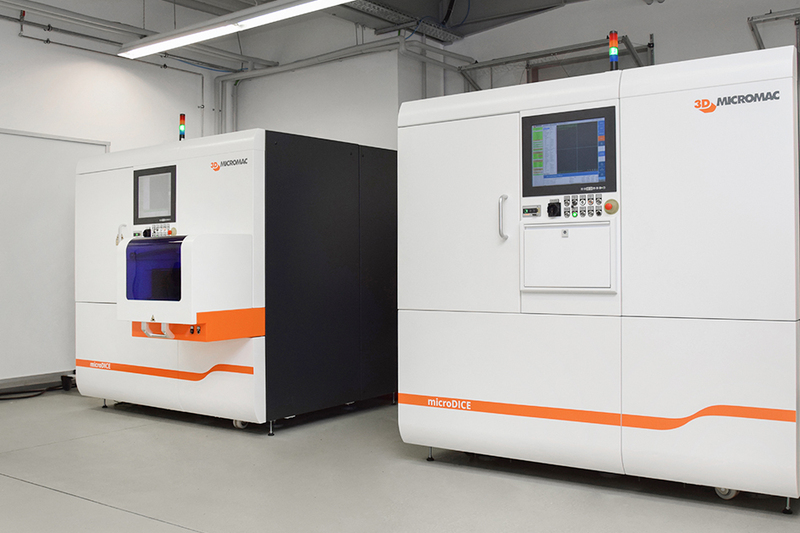 Capable of dicing speeds up to 300mm per second, the microDICE™ system provides up to a 10X increase in process throughput compared to traditional dicing systems. Its high throughput, outstanding edge quality and 300-mm wafer capable platform enables a true high-volume production process, especially for SiC-based devices. In addition, microDICE™ reduces the dicing cost per wafer by up to an order of magnitude or more compared to other wafer dicing approaches. Due to the contactless laser machining method, there is no tool wear and no expensive consumables are required. This results in up to 15X lower cost of ownership over the entire life-time of the dicing system. 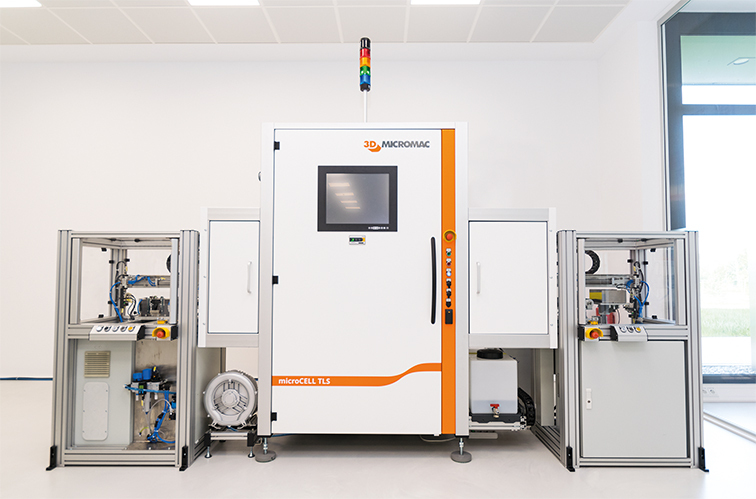 Combining a state-of-the-art laser optic module with 3D-Micromac’s highly modular semiconductor wafer dicing platform, the microPRO™ RTP provides selective annealing with high repeatability and high throughput. The system features a line scan option for vertical selective annealing and a step-and-repeat spot option for horizontal selective annealing, as well as three optional wavelength lasers (near infrared, green and ultraviolet), resulting in a highly flexible, high-quality laser annealing platform. The manufacture of certain types of MEMS devices such as integrated magnetic field sensors. Microstructure diagnostics and failure analyses are pivotal for the ongoing improvement of functional materials and sophisticated electronic components. Although lasers are well established tools in manifold applications, they have been broadly ignored for use in sample preparation due to concerns regarding their potential for causing structural damage. Today, however, the use of ultrashort pulses and optimized processing routes is addressing these concerns and enabling laser processing to finally enter the scene – speeding up microstructure diagnostics and failure analysis as well as opening up access to deeply buried structures and large-area preparation. Built on a highly flexible platform with a small table-top footprint, the microPREP™ and microPREP™ PRO systems allow for easy integration into FA workflows. Developed jointly with Fraunhofer Institute for Microstructure of Materials and Systems (IMWS), the microPREP systems complement existing approaches to sample preparation such as focused ion beam (FIB) micromachining, offering up to 10,000 times higher ablation rates and therefore an order of magnitude lower cost of ownership (CoO) compared to FIB. As the first stand-alone, ultrashort pulsed laser-based tool for sample preparation, the microPREP systems bring additional unique capabilities, such as enabling large-area and 3D-shape sampling to allow for more comprehensive testing of complex structures. The microPREP™ systems an be used for a variety of sample preparation techniques like SEM inspection of advanced-packaging devices, X-ray microscopy, atom probe tomography, and micro mechanics. The constant cost pressure in the photovoltaic industry as a continues challenge to solar cell manufacturers can only be solved by increasing cell efficiency with simultaneous reducing manufacturing costs. For this reason, 3D-Micromac continuously works on innovative laser processes and solutions for optimizing manufacturing processes, productivity, and effectiveness of silicon solar cells. The microCELL™ production solutions, such as high performance laser processing for Laser Contact Opening (LCO) of high efficient PERC solar cells as well as laser dicing of full cells into half cells with Thermal Laser Separation (TLS-Dicing™), are designed to meet cell manufacturers‘ demands for achieving maximum throughput rates and yield while diminishing cell manufacturing costs. In addition, 3D-Micromac offers the powerful roll-to-roll processing microFLEX™ system for production of flexible thin-film solar cells. Besides the integration of laser processing, also printing and coating techniques can be integrated. 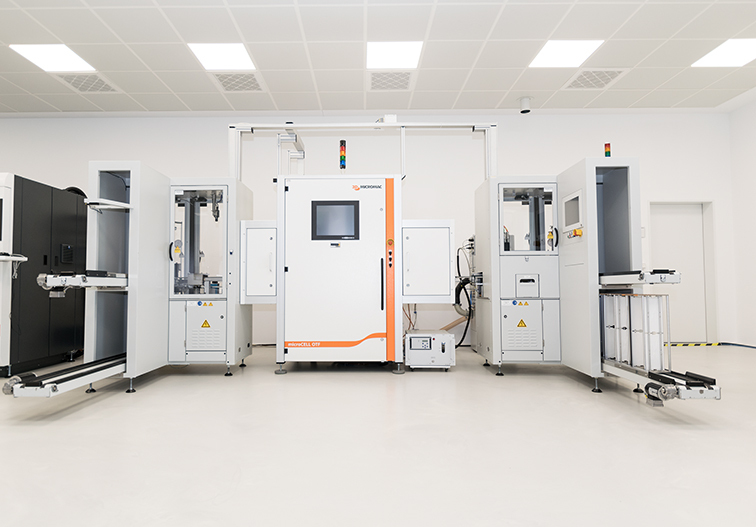 Using its extensive expertise on laser processing 3D-Micromac has developed the microCELL™ OTF as the most cost-effective solution for laser backside contact opening in the market. The highly productive laser system microCELL™ OTF meets cell manufacturers‘ demands for increasing the cell efficiency by precise surface structuring, low operating costs, and highest availability. Laser processing on-the-fly and an innovative handling concept enable maximum throughput and yield in the mass production of crystalline solar cells. The contactless cell handling enables processing without surface defects and microcracks. microCELL™ OTF is available for both new production lines and upgrading of existing cell production lines. 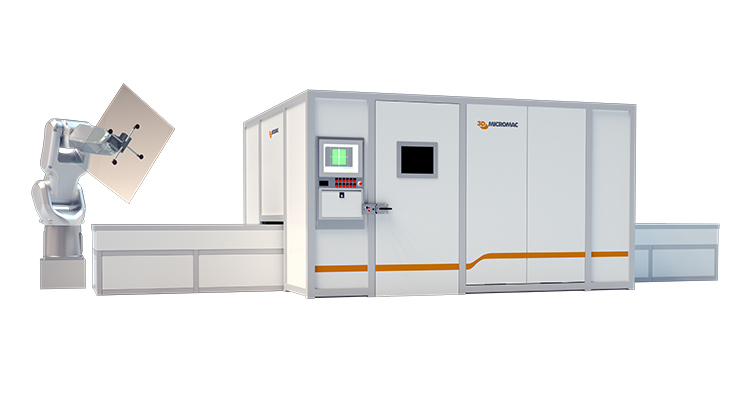 Approved in the semiconductor industry for the separation of chips, 3D-Micromac has introduced the patented ultra-high-speed Thermal Laser Separation (TLS-Dicing™) for particle free cutting of full size wafer into half cells or quarter cells. Unlike to conventional cutting methods TLS-Dicing™ splits the solar cell with an unrivaled speed. The separated cells show a significantly higher mechanical strength, better edge quality and a lower power reduction compared to laser scribing and breaking approaches. Based on the experience of the industry-proven laser tools for processing of PERC cells, the highly-productive microCELL™ TLS system achieves highest throughput in the market. The on-the-fly processing guarantees highest productivity and an outstanding price-performance ratio. The fully automatic 24/7 production solution is available as stand-alone or inline system. The experienced 3D-Micromac employees understand solar manufacturers’ requests and are familiar with the way of working in a modern 24/7 production environment with high reliability in mind. 3D-Micromac’s worldwide network of engineers and service partners support customers throughout the lifecycle of the laser systems. In addition, 3D-Micromac has a fully equipped application laboratory with experienced process engineers to support customers in feasibility tests, process development, and realization of customized solutions. This immensely helps to reduce ramp-up times in production. Glass materials such as borosilicate, aluminum silicate (e.g. Gorilla®), quartz and other types of specialty glass are used in many applications due to their unique properties such as thermal and dimensional stability, surface quality, hermeticity, process compatibility and optical performance and as flat and hollow glasses in many industries. The processes range from laser cutting through the production of filaments/modifications, laser drilling up to layer-by-layer ablation to the manufacturing of 3D structures. In addition, the laser is ideally suited for removing coatings thanks to its high selectivity. Furthermore, laser engravings can be generated on the surface or inside the material. The processing of the glass materials takes mostly place in the form of round substrates such as wafers all the way to large-area panels. Increasing the production throughput requires the processing of ever larger panels or even the conversion of wafer processing to panel processing. Typically, in industrial applications, rigid glasses with a thickness of greater than 0.3 mm are used. Currently, the latest developments are being pushed towards thinner and more flexible substrates. This trend offers the opportunity for new applications and designs. For manufacturers, this means above all the conversion to new and flexible production technologies. 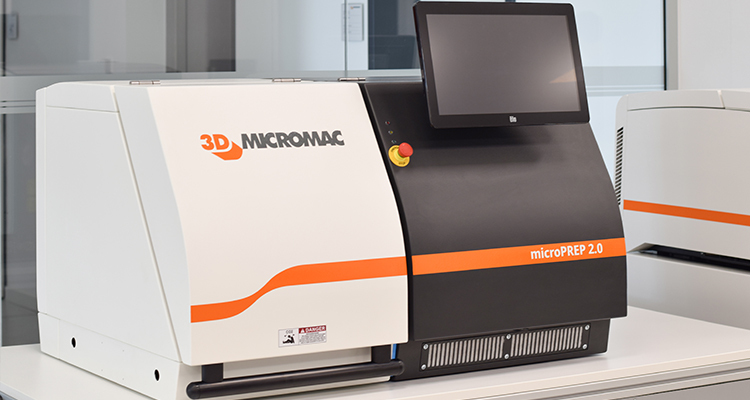 With the microSHAPE™ laser systems, 3D-Micromac offers unique processing technologies and innovative process management for the cost-effective and high-quality processing of wafers and large glass substrates. All processes meet the requirements of industrial customers and guarantee clean and gentle processing as well as excellent processing quality.